Many things change with time, but in the U.S., this truth remains steady: Your home is your castle. You may do with it as you wish. Options for improving its beauty, function and comfort are as limitless as your imagination and budget. We’re fortunate to have top-quality locally owned businesses in our region that can educate us about those options. Local professionals offer an invaluable reservoir of ideas, experience and expertise. Gustafson’s Furniture and Mattress is a local furniture store that opened in 1928 on Seventh Street. The family-owned business now has locations at 808 W. Riverside Blvd. and 6651 E. State St., Rockford. The late Martin Gustafson got his start selling washing machines door-to-door. Today, his son Dale Gustafson runs the enterprise with wife Trina and sons David and Christopher. Together the two stores offer more than 200,000 square feet of showroom space filled with furniture and mattresses, representing a wide spectrum of price points. Mitchell Johnson, manager of the East State Street location, has been educating people about furniture and mattresses for decades. Over those years, he’s closely observed the evolving preferences of customers. Gustafson’s recently expanded high-end lines like Bassett, Flexsteel and Daniel’s Amish. Customers in our region prefer a transitional furniture style, which is someplace between traditional and modern. Distressed wood finishes dominate, consistent with an overall trend toward easy-care surfaces throughout the home. Gray remains a popular neutral color in both wood and upholstery. “We sell a lot of leather but we also sell a lot of fabric sofas,” Johnson says. “There’s a trend toward more texture, with tweeds and corduroys and weaves. Today’s upholstery options are really wonderful – very durable but beautiful and comfortable.” Those who order custom sofas from Gustafson’s have 900 fabrics from which to choose. “Reclining furniture is very big, in every age group, across all demographics,” adds Johnson. When buying furniture, the most important consideration is not how it looks, but what lies beneath. “Ask good questions,” Johnson suggests. “Is the frame made from strong laminated wood or just plywood? Is there a reasonably good spring system that will distribute weight? Is the padding made of high-density foam or cheap fluff? Is the leather exterior real leather? Few would argue that the kitchen is the nerve center of the home. It’s important to make it a functional and comfortable place to spend time. For more than 30 years, Diane Feuillerat has been designing luxury kitchens, baths, libraries, offices, laundry rooms and entertainment areas. Her large number of repeat and referral customers speaks volumes about the quality of work offered at Kitchens by Diane, 6346 E. Riverside Blvd., Loves Park, Ill. She especially delights in problem solving. Form and function are equally important to Feuillerat, who keeps up with national trends. Right now, homeowners prefer a clean, straightforward look in their kitchens. Feuillerat can design and install a whole new footprint for a kitchen remodel, but smaller tweaks often make a big difference, too. “I’m replacing a lot of kitchen peninsulas with islands, when space allows, which often has the effect of making two spaces feel more like one big room,” she says. Another popular update is to replace built-in kitchen desks with storage space or a beverage center that makes entertaining easier. Quartz and natural stone counters remain popular in kitchens and baths. Feuillerat finds herself removing many bulky whirlpool tubs from bathrooms, replacing them with walk-in showers that help aging homeowners remain in their homes longer. Whether you’re outfitting a new kitchen or updating an older one, appliances play a starring role. A wide selection means you can keep things as simple or technically advanced as you wish. The bells and whistles offered by high-end manufacturers like Viking, Wolf, Sub-Zero, GE Monogram and Bosch are mind-boggling; all of those brands are sold at Guler Appliance, 227 Seventh St., Rockford, now in its third generation of family ownership. A stroll through the Guler showroom reveals the continuing popularity of six-burner commercial ranges with griddles; convection ovens and drawer microwave ovens; and refrigerators with various built-in dispensers and beverage blast chillers. Small refrigerators that store beer at a constant 34-degree temperature are a practical and fun addition to the beverage centers popping up in modern homes. It’s important to buy appliances from locally owned stores that stand behind products and employ factory-trained service people. A big-box store is more likely to push a costly extended warranty and leave you on your own when trouble strikes. When Joe Weller began installing closet systems more than 30 years ago, options were pretty limited. “When I started in this business in 1985, most everything was shelf and pole construction, and closet design wasn’t talked about much. That has changed,” says the owner of Shelving & Bath Unlimited, 4337 S. Perryville Road, Cherry Valley, Ill.
Today, almost 80 percent of Weller’s customers opt for custom laminate closet systems that look like finished wood cabinets. Along with more than 50 melamine colors and textures, there are also options for granite surfaces, glass shelves, motion-activated LED lighting – even inside the drawers, if you like – built-in mirrors, jewelry trays, removable laundry bags, a fold-out ironing board, adjustable cubbies made for shoes, boots and handbags, and much more. “Many people are using fewer or no dressers in their bedrooms and are choosing instead to maximize their closet space,” Weller explains. While some people go so far as to convert spare bedrooms into luxurious walk-in closets, others double or triple the efficiency of their reach-in closets by having them professionally designed. Either way, it’s the design expertise offered by Shelving Unlimited that makes it possible to meet organization goals. Along with adjustable-shelf laminate storage, Shelving Unlimited offers wire shelving systems by Rubbermaid, the No. 1 brand in the industry. When a customer calls Shelving Unlimited, Weller typically makes a home visit to measure spaces and observe the placement of air vents, light switches and fixtures, electrical outlets and the direction that doors swing. He also takes customers through a series of questions about how the space will be used. Next, Weller custom designs a plan and presents options, then installs the new storage system down to the smallest detail. Customers can browse the showroom to see examples of options, if they so choose. Flooring, too, is trending toward softer, easier-to-live-with materials, says Kevin Rose, president of Carpetland USA Colortile, 326 N. Alpine Road, Rockford. Carpetland is the longest continually running flooring store in Rockford and has a second location in Sycamore, at 1719 Dekalb Ave.
Not to be confused with the plastic-looking vinyl floors of yesterday, luxury vinyl imitates natural wood and stone products with uncanny accuracy. The image on the surface of the vinyl is topped with a durable finish that resists stains, scratches and dents. Vinyl products are softer and warmer underfoot than real stone or tile and far easier to install, although Rose still recommends professional installation. Unlike laminate flooring, which can disintegrate in moisture, or solid wood floors, which can warp in the Midwest’s fluctuating humidity, “Luxury vinyl is 100 percent waterproof, which means it can be used in basements, bathrooms, laundry rooms, kitchens and anyplace moisture could be a problem,” says Rose. Much wider planks and much larger tile sizes are more common today. We’re covering fewer square feet of our homes in carpet these days, but it’s still highly valued in certain rooms for its warmth, softness and beauty, especially in four-season climates like ours. Rose says the durability of carpet varies greatly and “you really do get what you pay for” when it comes to choosing a carpet of good fiber with adequate face weight, density and twist. 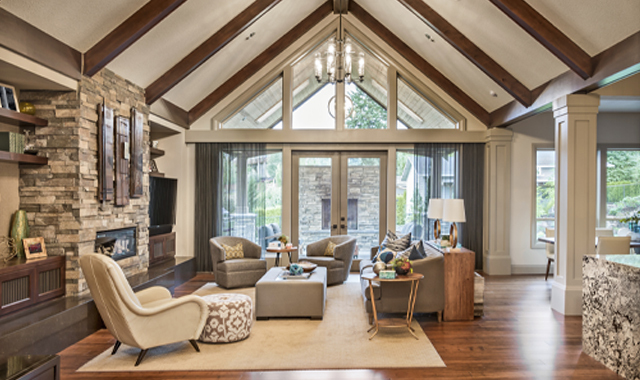 When it comes to making your home more efficient, few things make a bigger difference than the way your fireplace is outfitted, says Brad Vander Heyden, owner of Advanced Chimney Systems, 3486 Lonergan Dr., Rockford. Advanced Chimney Systems is now in its 32nd year of business. Along with selling and servicing fireplaces, it sells freestanding stoves and other alternative heating methods, glass fireplace doors and accessories, smokers and grills. It also conducts in-home service and chimney repairs. With natural gas costing just a fraction of what it did a few years ago, it’s not surprising that Vander Heyden sees many customers converting their wood-burning fireplaces to gas or upgrading their existing gas fireplaces. While most homeowners want to have and use a fireplace, they also want it to be convenient to use, says Vander Heyden. This only adds to the popularity of gas fireplaces. This entry was posted on Thursday, April 21st, 2016 at 11:59 am	and is filed under Home & Garden. You can follow any responses to this entry through the RSS 2.0 feed. Both comments and pings are currently closed.